I've been having obsessions with certain foods recently. I suspect, a sign that I'm less run down and have some semblance of an interest in cooking again - something that has been distinctly dormant in recent months. This is one of my obsessions, and is a gorgeous Turkish breakfast. It is simple, but quite slow to make so definitely not a breakfast when you're in a hurry! I've had this many times on holiday in Turkey over the years, but never thought to try and recreate it at home. One of those dishes that don't always translate to another country, I guess. This is partly down to the UK having distinctly rubbish tomatoes! I cheated a little and boosted the tomato flavour with some tomato purée, but it's a small compromise for a delicious dish. 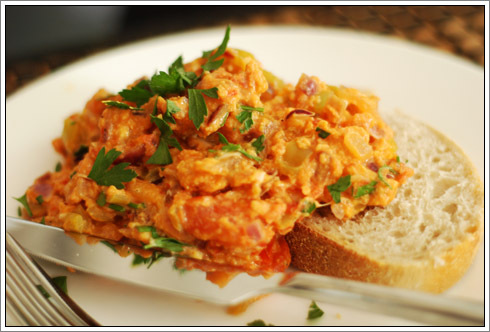 And with the beautiful summer sunshine that we are currently experiencing, my opinion changed - it is definitely the perfect weather for menemen. A tip on tomatoes - buy them on the vine and never put them in the fridge. They won't be quite as good as Mediterranean ones, but leave them out for a few days and they will have a lot more flavour. Slice the tomatoes in half, grate them into a bowl and then set aside for the time being. Finely chop the onion then deseed and chop the green pepper. Melt the butter in a large saucepan then gently cook the onions until softened. Add the green peppers and cook for about a further 5 minutes. Add the tomatoes, and if they're a bit anaemic, a teaspoon of tomato purée to give them a flavour boost then turn the heat right down and cook until almost all the liquid has evaporated. Season to taste with a little salt and pepper - I found my tomatoes were quite sharp so needed tempering slightly. While the liquid is reducing, crack the eggs into a large bowl, add the thyme and chilli flakes and season with salt and pepper. Gently whisk until all the ingredients are combined. Once there is very little liquid remaining in the tomato mixture, pour in the egg and gently stir as you would scrambled eggs. Don't overcook them - part of the joy of this dish is a smooth, very slightly liquid egg mixture. Just before it is ready, stir in about 3/4 of the parsley, reserving the rest for garnish. Spoon the mixture over slices of lightly toasted bread, garnish with the remaining parsley and enjoy! Perfect for a weekend brunch.